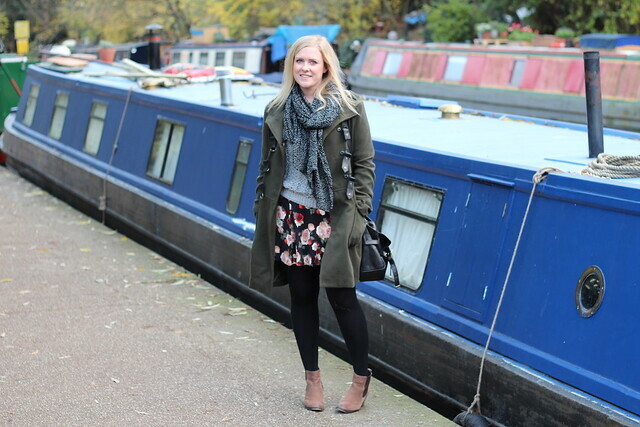 One of the areas of London that I love the most, and love living so close to is the Canal. Sure, it’s not all gorgeous boats and cute ducklings, some of it is a bit grotty but I love that it’s generally very pretty. Means I can walk from mine to Camden in under half an hour (also love the fact that it makes marking a 5k run really easy using the locks) and there are some lovely things along the way. Up in Little Venice (arguably the ‘prettier’ end of the Grand Union section that runs through London) has lots of lovely pubs overlooking the water. Down towards the King’s Cross area there’s the new Granary Square area that’s been part of the redevelopment of the space behind King’s Cross/St Pancras station that seems to have taken a while and now be shooting up faster than you can say Platform 9 and 3/4.. 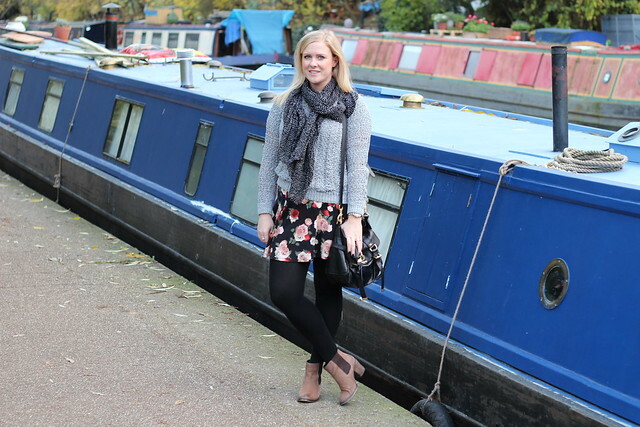 So basically the point of that little ramble is as an intro to this post which is just a little outfit one for something I wore for a chilly but not rainy walk along the canal… details at the bottom! Boots are my all time favourite ankle boots from ASOS (last year, similar here), tights the ever awesome ‘super cosy’ ones from Primark. Skirt is a recent purchase from the H&M Divided collection (here, similar from ASOS is below). Jumper is an older one from American Eagle (similar here). bag is a black Mulberry Alexa and coat is a military style one from BooHoo (last year – similar: here). Scarf was also for H&M, but is old so found a similar one: here. Have to say I totally recommend BooHoo for coats – I have two that I purchased from them (think it was last year, may have been the year before) but they’re both really cosy, look more expensive than they were and have lasted really well. The fake fur one I bought from them is amazing – one of the warmest coats I’ve ever had and think it was only around the £40. Bargain. Gorgeous skirt and loving the coat too, great look overall. I’m in love with winter florals! This look is so cute! You have 5K walking/running along there? That is so good, I wish I had that kind of ‘track’ just fields around here! Yep, to Camden and back along the canal is 5k so a perfect run distance for me!